Leelah Alcorn, 17, committed suicide on December 28th 2014, after she walked four miles from her home onto an Ohio interstate, where she was struck and killed by a semi-trailer. Leelah was a transgender teenager who was active on the popular social media site Tumblr. Before her suicide, she wrote a heartbreaking suicide note and placed it in her queue. Her note details how she felt like “a girl trapped in a boy’s body” starting at the age of 4, the lack of support from her Christian parents who believed that “God doesn’t make mistakes,” and academic worries. This seemingly innocuous phrase has become so predominant that it has gone past its role as just a saying. Specifically, the It Gets Better Projectwas created by gay-rights activist and author Dan Savage “to communicate to lesbian, gay, bisexual and transgender youth around the world that it gets better.” Hundreds of gay and transgender individuals across the globe have recorded videos of themselves sharing personal stories to encourage other troubled youth to not give up hope. The It Gets Better project was historic in terms of scope and impact. Although the comfort of “it gets better” reassures some, for many others, it simply isn’t enough. It is easy for people to adopt this mentality without taking any further responsibilities themselves. Leelah felt her life getting worse with each passing day. Her experience, unfortunately, is not unique. Many transgender youth face physical or emotional abuse from family members and friends. They are more likely to be physically assaulted and murdered. Society tells trans youth that “it gets better” as the first line of defense to their troubles as though we are powerless to actually change the paradigm of discrimination. We have lulled ourselves into a false sense of security. We have convinced ourselves that everything will be okay as long as trans youth justwait it out until they’re older because, after all, “it gets better”. In repeating this rhetoric of “it gets better,” we have convinced ourselves that we are powerless to help. This is a call to not reaffirm “it gets better,” but to make a stance that you will actively help to make it better for the transgender community. 1)Educate yourself on transgender issues. If you know nothing about trans people, learn about their high rates of suicide and violence. Learn correct pronouns and terms, and how being trans can be different from one person to the other. In short, recognize your privilege and expand your worldview. 2) Donate: You can donate to various nonprofits that support transgender people, including The National Center for Transgender Equality, TransOhio, Trans Women of Color Collective, and Trans Student Educational Resources. Donations will help these nonprofits to continue their support of the transgender community. 3) Don’t police the way people dress. Do not tell a person only to wear “girls’ clothes” or that they cannot wear something because it’s “boys’ clothes.” Clothing is a tool of expression for the individual. 4) Fight fire with fire (and love). If someone says God sees trans people as unnatural, you can point them towards Galatians 3:28: “There is neither Jew nor Gentile, neither slave nor free, nor is there male and female, for you are all one in Christ Jesus.” If there are Christian parents who kick out their child, point them to Timothy 5:8: “Anyone who does not provide for their relatives, and especially for their own household, has denied the faith and is worse than an unbeliever”. It is no surprise that the major philosophy of all religions is love and peace. Fight religious intolerance with the true teachings of compassion that they espouse. 5) Don’t be silent in conversations. If a friend or family member talks negatively about transgender people (for example, misgendering them or using a transphobic slur), speak up. The hatred of transgender individuals is usually fueled by ignorance. If you are in the position to help alleviate that ignorance, do so! 6) Use Social Media to Spread Awareness of Trans Issues. 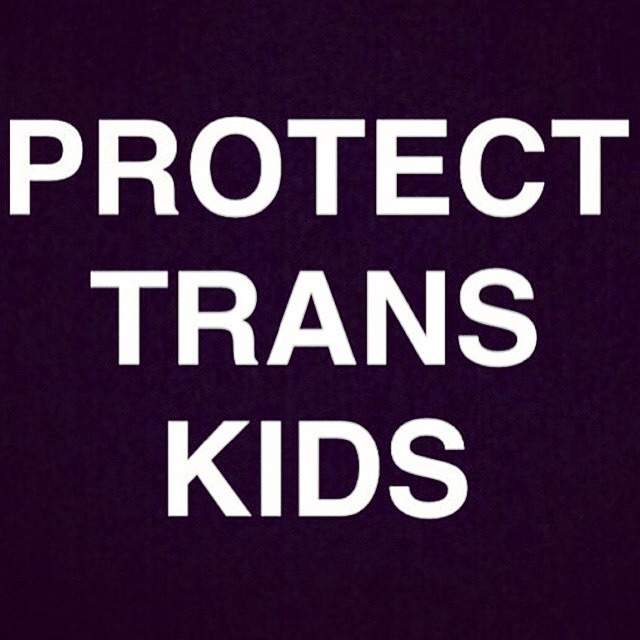 Change your profile picture on Facebook, Twitter and Tumblr to say “Protect Trans Kids.” Click here. Make a status update to remind your friends that transgender people are people too. 7) Sign the Petition. Sign the petition “Enact Leelah’s Law to Ban Transgender Conversion Therapy,” which was started by The Transgender Human Rights Institute. 8) Talk to your Local Government. There is word going around about a “Leelah’s Law” to ban conversion therapy. While this is a great (and crucial) start, we should also focus on reducing medical costs for trans people to transition, build more shelters for any trans kids that are kicked out or wish to leave, and even find a way to make a case like Leelah’s one for parent abuse and negligence. You can send a message to your congressman/congresswoman, asking them to consider legislation or reform that addresses these issues. Oh my gosh this is such a great idea!!! how will you prove your donation? We will post a screenshot likely in this comments section when we make the first part of it. Given this message is still spreading we are going to let it saturate over the next one or two days prior to donating right after. It should also be recorded publicly on our tax accords.